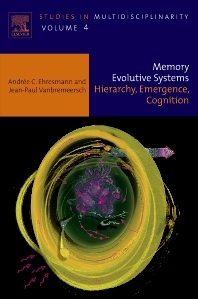 Memory Evolutive Systems; Hierarchy, Emergence, Cognition provides comprehensive and comprehensible coverage of Memory Evolutive Systems (MEM). Written by the developers of the MEM, the book proposes a mathematical model for autonomous evolutionary systems based on the Category Theory of mathematics. It describes a framework to study and possibly simulate the structure of living systems and their dynamic behavior. This book contributes to understanding the multidisciplinary interfaces between mathematics, cognition, consciousness, biology and the study of complexity. It is organized into three parts. Part A deals with hierarchy and emergence and covers such topics as net of interactions and categories; the binding problem; and complexifications and emergence. Part B is about MEM while Part C discusses MEM applications to cognition and consciousness. The book explores the characteristics of a complex evolutionary system, its differences from inanimate physical systems, and its functioning and evolution in time, from its birth to its death. This book is an ideal reference for researchers, teachers and students in pure mathematics, computer science, cognitive science, study of complexity and systems theory, Category Theory, biological systems theory, and consciousness theory. It would also be of interest to both individuals and institutional libraries.